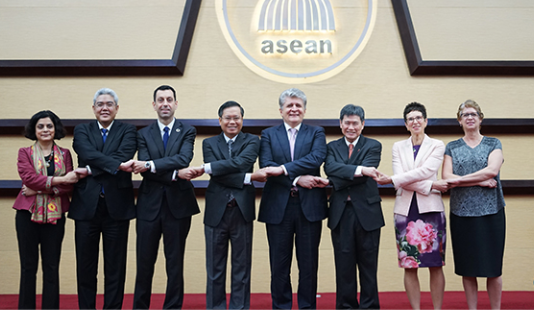 The Association of Southeast Asian Nations (ASEAN) is emerging as an indispensable global partner and role model - it has a vital and growing role to play in ensuring peace and stability in the Asian region and beyond. The ASEAN-UN partnership continues to grow, especially since the adoption of the “Joint Declaration on Comprehensive Partnership between ASEAN and the United Nations” in November 2011 and the adoption of the first ASEAN-UN Plan of Action for 2016-2020. The Plan of Action sets out strategic priorities, activities and measures to be undertaken by both sides to further enhance their political-security, economic, and socio-cultural cooperation, including on cross-sectoral issues, as well as Secretariat-to-Secretariat collaboration. Regular meetings are held to discuss progress in the partnership at the Secretariat-to-Secretariat-, Senior Official-, and Ministerial-levels. Since 2000, ASEAN-UN Summits have been held regularly, bringing together ASEAN leaders and the United Nations Secretary-General. The Chairman’s Statement of the 9th ASEAN-United Nations Summit held in November 2017 in Manila, the Philippines, is available here. In addition to supporting the UN system in its engagement with ASEAN through the Department of Political and Peacebuilding Affairs (DPPA) Liaison Officer to ASEAN, DPPA is working directly with ASEAN in the areas of sustaining peace, preventive diplomacy and conflict prevention. Among the joint activities, the ASEAN-UN Regional Dialogue (AURED) series provides a regular annual Track 1.5 forum for discussion of regional peace and security challenges. The fourth ASEAN-UN Regional Dialogue was held in Malaysia in December 2017 and focused on the Role of Women in the Prevention of Violent Extremism. In late 2017, DPPA also co-organized the first ASEAN-UN Electoral Observation training in the Philippines and the first ASEAN-UN Training on the Law of the Sea, including the UN Convention on the Law of the Sea in Indonesia.